Playa de La Tejita is the largest natural beach in Tenerife, with 1 km in length and almost 40 m wide. 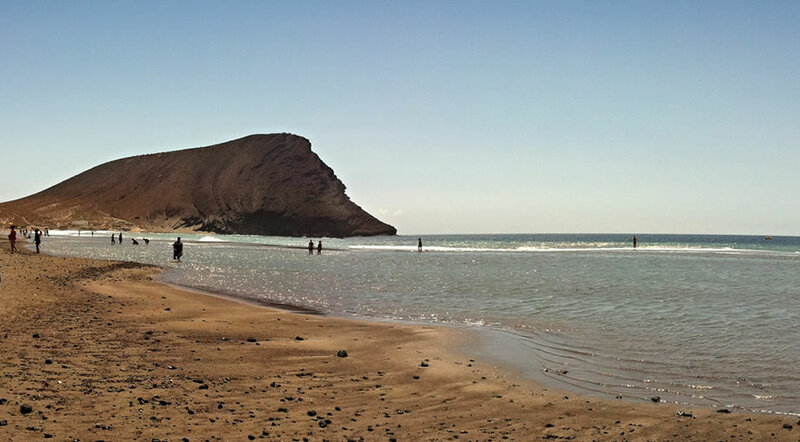 It is located close to El Medano beach, on the other side of the volcanic cone called Montana Roja. The part of the beach that is closer to Montana Roja is considered nudist friendly and it is a great place to spend an entire day. On the other side of La Tejita beach you will find some sun loungers and umbrellas, a small kiosk shop, but the area in general is not commercial like the big tourist resorts. Similar to El Medano, the wind is constantly blowing here at Playa de la Tejita, so it has ideal conditions for watersports like surfing and kite surfing. For swimming the water can be dangerous, due to the currents and waves and also the lack of lifeguards. For families with children the beach offers a lot of room for running and playing, but the ocean here is dangerous for small kids, so pay extra attention. Montana Roja, the big hill right next to the beach is declared a nature reserve and it takes around 30 minutes to climb on top of it for the best views of the ocean and the beach itself. If you plan on spending the day at La Tejita beach you should consider bringing some snacks and an umbrella or beach tent, because the area is very open and you will not find many places to hide away from the wind and the sun. Since the entire area is protected by law, the only car park is on the road between El Medano and Los Abrigos, you will have to walk for about 5 minutes on foot from the car to the beach. On the same road there is a bus stop, so you can use the local guaguas to come here. Compared to other beaches, Playa de la Tejita is never crowded due to the isolated position and lack of restaurants and hotels. It is a favorite spot for naturists and people who seek peace and quiet, away from the big resorts.